My focus is about solving my client’s challenges in a beautiful & creative fashion. It’s like putting the pieces to a puzzle together until you find the perfect solution. I believe that top notch customer service and project management is critical to a successful project on every level. After 18 years with Closet Factory, I still get excited when I see the difference we make in people’s everyday lives. 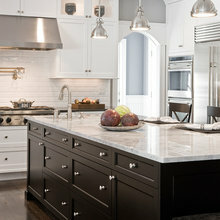 Free consultations in your home or at our new Tyson's Corner showroom by appointment. Deborah has been great to work with- We had 13 closets that needed to be redone. Unfortunately, we have limited knowledge of what would be appropriate add in all of our closets. Deborah was great at listening to our wishes and goals, making a lot of great suggestions. The end results definitely shows! I'd definitely refer her to anyone who is looking to make all of their closets beautiful, efficient and full of bells and whistles! Deb, you and the install team rock and roll! My yarn closet is overwhelming beautiful. I am looking forward to other projects with you. Thank you! Thanks Robin! You were a true joy to work with & I am so happy that the yarn built-ins surpassed your dreams! I'll be watching to see your projects - your hands never stop moving! Working with Deb was an absolute dream! Her knowledge of space, style, and functionality is unparalleled. 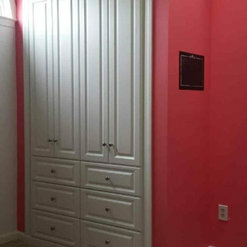 She took an extra bedroom and transformed it into the closet of my dreams! 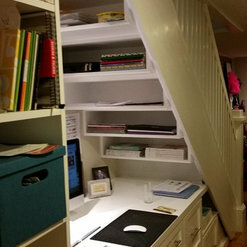 Thanks, Ashley - it was such fun creating your perfect space! Deb was a true blessing during our home renovation, and was critical to making sure that we were able to de-clutter and maximize storage while keeping daily essentials out of view and organized! In 2016, she helped design a floor to ceiling, wall to wall custom closet based off a couple inspiration photos and a detailed, non-rushed meeting to discuss our goals and budget. She and her crew were extremely precise with measurements, conscious of our time and budget limits, and detailed from start to finish! She worked with us to incorporate custom handles and meticulously planned to ensure that the closet system would accommodate every article of clothing, shoes, etc. that was needed. Everything is now easy access, and without the visual clutter we had before! 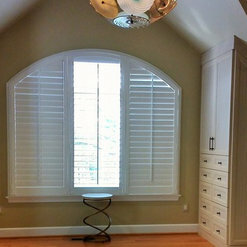 We were so pleased, we also had her work on designing a very difficult, custom storage solution for under the stairs. This was a very precise task, and required re-building the stairs and shoring them up first through another contractor. She leaned forward with us to plan, measure, and begin the order to minimize time lost in this final stage of the renovation. 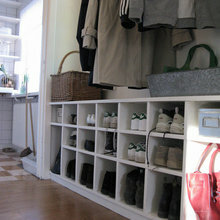 In the end, the closet system under the stairs allowed us to completely re-purpose the "storage room" we had reluctantly kept in chaos for several years. She again worked relentlessly to understand our needs, and made the inside layout both customizable and practical - also including a rather difficult in concept hidden bike storage. Throughout it all, we couldn't have asked for more. Attention to detail, communications, flexibility, and price were all unbeatable! It's almost sad that we no longer have storage needs, but that's a testament to her skill - and if we ever need another solution, she'll be the first and only one we call without a second of hesitation! Thanks Chris! It has been such an honor to work with you on your renovation. I loved every minute of the challenge & appreciate the collaborative process with you so much! Deb is wizard at making the most of closet space. She helped us utilize every inch of our newly remodeled closet. It is highly functional and beautiful. The craftsmanship of her installation team is also professional and skilled craftsman. We really enjoyed working with Deb and would highly recommend her. Thanks, Jennifer! I'm so glad that you are pleased with the finished closet. 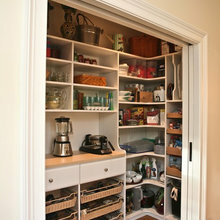 It looks wonderful & you are making the most of every inch of space. I hope you enjoy it for many years! Deborah was just excellent in helping me plan my new walk-in closet. It is a large space and we are thoroughly enjoying it. She had great ideas, and was able to relate to my style and what I wanted. And she delivered with ease and on the time schedule that was agreed upon. Loved working with her and would highly recommend her. 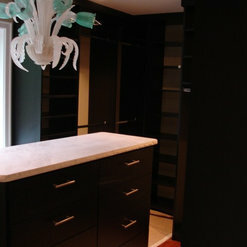 Thanks Cathy - I loved working with you to transform the space into a wonderful closet! Deborah gets high marks for professional demeanor, patience, and creative know how. 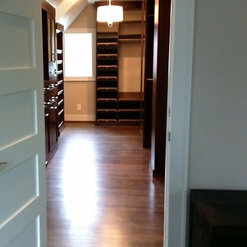 My wife and I were fortunate to have her assist in designing his and her walk in closets for our new home. 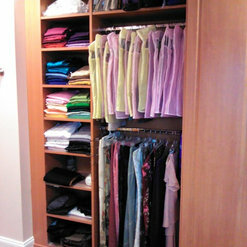 Thanks Chris - I loved working with you & Mary to create the closet organization you needed. Seeing your home come to life was a big bonus for me - it's wonderful! I have a very small condo and had a whole wall in my bedroom where I was looking to maximize some storage space; I had a couple of dressers, but was missing out on vertical space usage. Deborah was utterly professional, quick about measurements, and was able to provide me two designs in short order from which to choose. She was also very conscious of my cost parameters and came in at well under what I expected a project like this might cost. I now have double the hanging space in my bedroom (it did already have one closet), a desk where I previously had no room for one, and some shelving (behind the doors on the left)! All without losing any drawer storage, either. The installation team was also wonderful! Done in one day and very communicative with both me and Deborah throughout the process. 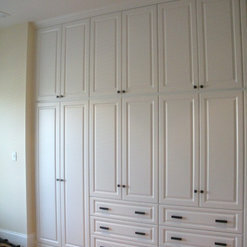 I love how terrific the storage/wardrobe wall turned out! Thank you, Misha for allowing my team to help transform you space! I rarely write reviews, but in this case, I had to because of the great design and service provided by Deb Broockerd and her team. We have undergone a total house renovation with a modern aesthetic. The work was for our mud room and home office. During the design process, we were deciding between Closet by Design, California Closets, and a few other companies (all of which were companies we used/trusted in the past for our previous home), but Closet Factory beat the competition on all fronts - design, materials selections, and price! Deb came out and understood our needs right away, and in a matter of days, she was able to nail down the exact design we wanted. She is not a designer that has to get everything her way. She listened to us and our ideas, worked through various alternatives, and even spent a good deal of time trying to find the exact "modern" legs we were looking for! She was upfront and honest about costs from the beginning. She was highly responsive and worked through the weekend (we have emails and texts to prove it), ultimately giving us not only the best design but a price that was better than all the competition. It is important to mention that we encountered some unfortunate delays in our renovation, so we have had to reschedule installation several times. 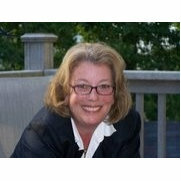 Deb and her team never protested but worked with us throughout, accommodating our timeline until the very end. This was one of the few bright spots in what was a very challenging renovation project. Deb and her team did great work and we highly recommend!!! Thanks George - it was such a pleasure to work with you to create the perfect solutions for your mudroom and home office. I am so happy that everything turned out as you wanted it to. Would love to work with you again any time you have another storage need. Your new home is amazing! Deborah was great from the beginning to the end. She had great suggestions right from the start. She listened to the specific details of what I was looking for and proposed exactly what I wanted. Thanks Jo Ann - I loved working with you on your new home! Deb works magic. I moved from an apartment with a giant walk-in closet to a small house with tiny closets. Deb was extremely patient with me and my need to try to adjust my mindset. With her help and design I now have bedroom closets that are still small in size but that fit a lot of clothes and shoes. And I even have extra space! I was also very impressed that even though this was a small project for Deb, she was as professional and involved as if it were a big project. I want to give a shout out to the installer, Justin. He was very professional and polite, answered all my questions and left my house immaculate. 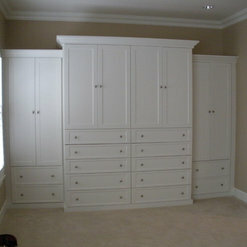 Linda - It was a great pleasure to work with you & I am so glad that the new closets have helped you get settled! I'll be sure to pass your kind words along to Justin - he does a great job every time!